I love reading newspapers on my iPad. I get them delivered to my tablet without having to go to the letterbox, never mind the newsagent. I can catch up on the news wherever I am in the world, as long as I’m online. 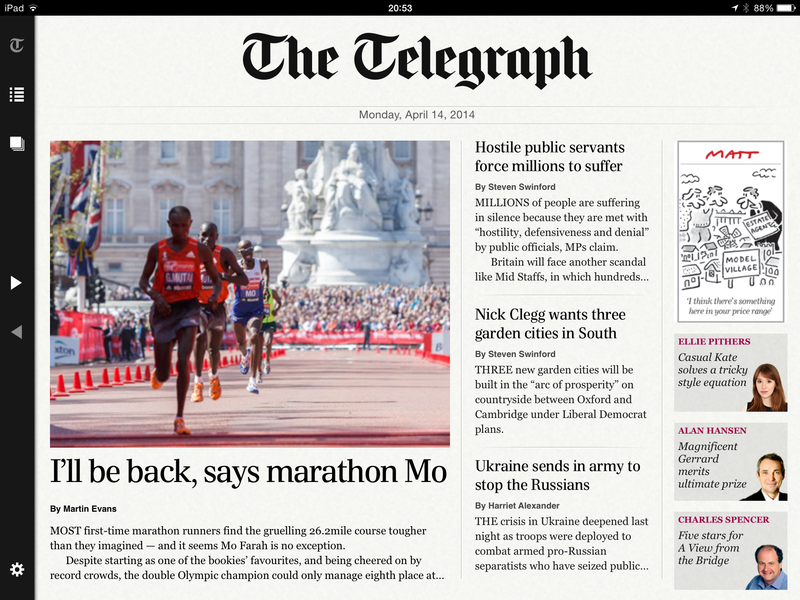 The Daily Telegraph iPad app is one of my favourites, as it’s one of the most elegant apps. But it’s not the most reliable. It rarely if ever downloads automatically, unlike the Guardian and Sunday Times. And recently it has stopped downloading at all: it sticks at 8% downloaded. Time to use the app equivalent of turning a pesky computer on and off again: I deleted the app completely and downloaded it afresh. This is where I ran into difficulties. It asked me to enter my details as a subscriber. I chose ‘digital subscriber’. But it didn’t recognise me. I tried again. And again. Still no joy. It kept asking me to buy a subscription, which I already had. At this point I called the 0800 number. A helpful man told me I needed to take a different route: click on the cogwheel on the bottom left of the app screen. Click subscriptions, then choose restore purchases. Enter Apple ID password – and you’ll not be asked to buy a new subscription.